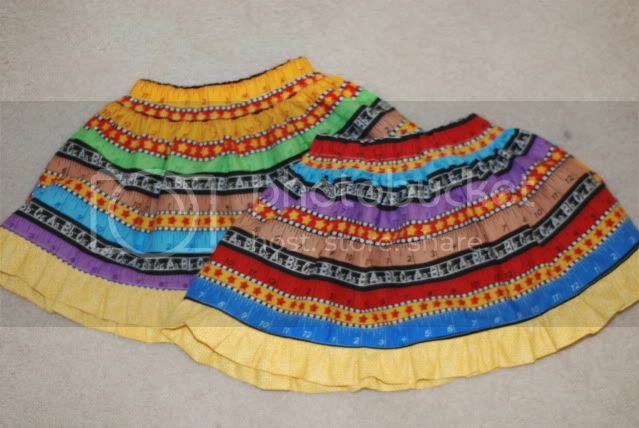 1st Day of School Skirts… – Everything Your Mama Made & More! Since Zander hasn’t grown much in the last year his ABCD shirt still fits him & he said he wants to wear it for the first day. He went to the 3 yr old program last year but this year he is in Pre-K! But my little baby girls are going to be starting school this year too! Zander’s preschool offers a 2 yr old program that is just one day a week & I signed the twins up. I think if I just had one 2 yr old I may not bother, but I think it will be good for the twins to learn how to behave at school before they go next year for the more structured learning! Anyways I know it’s not ‘real’ school, but it’s the first time they have gone anywhere with out family!!! So I threw together these little skirts. They look much cuter on, the only thing that bugs me is that in order to get both skirts & waist bands cut out I had to cut 2 pieces & sew them together so the rulers/stripes are totally different on the front & back so you can see it on the side seams! Most people probably won’t even notice & the girls could care less… it’s just little things like that, that can drive me nuts! I will have to get model shots later… they tried them on last night with these cute red shirts I got from Baby Go Retro, but then they had a snack & got them dirty, so they are in the wash now! They each used 1 yard of fabric total (the ruffle is doubled over). I was finally able to get my 201 uncovered & get my ruffler foot out… I am SO in love! Was this a pattern? How did yo do the ruffle? Very cute. Nope, no pattern & no ruffling required!